We were at a game night playing Small World (by Days of Wonder) and weren’t enjoying the combat and other bits of the game play. We thought, we could make a game better and that was more fun… and then went on to try it with Turf Wars. Turf Wars in early 2012 was inspired by Smallworld because we loved the concept of different fantasy factions at odds with one another, but felt the execution wasn’t our cup of tea. We decided to make our own spin-off, possibly just for our own gaming group to play, and wound up liking the process so much that we continued it with other games. We have a tendency to have hidden information and/or traitors because, well, we like playing those sorts of games. We are bastards and we like where you can be a jerk to your friends without them knowing it… not right away at least… unless it’s Cindy from our group. She’s almost always the traitor. Short answer–no. We thought we’d never design a worker placement game or a game about something tedious like construction, but then there was a request for a construction-themed game. We decided to challenge ourselves by jumping on the opportunity and we created “Under Construction” which is all about construction (bidding on contracts, collecting resources, building them and collecting payment) and features worker placement as well as resource and time management. We felt that many worker placement games typically become boring (to us), and often end up feeling solitary and predictable. With the desire to avoid that in mind, we leveraged worker placement as a primary mechanic and focused on other mechanics to increase the social interaction and fun factor of the game. Now we can say that we designed a game about the construction industry that we ourselves would happily play. We generally start with theme. We keep a running list of all the game themes we would like to see in a board game because there is either a lack of them on the market or because we ourselves enjoy them. Once you have a theme in mind, it’s easy to imagine a goal of the game, and then brainstorm about the possible mechanics to reach said goal. We try to hammer out ideas as quickly as possible so that we can get to a playable prototype and then decide if there’s “something” there. Don’t force it. If you’re not enjoying the creation of a game, then nobody is going to enjoy playing it. Labors of love are loved in return. 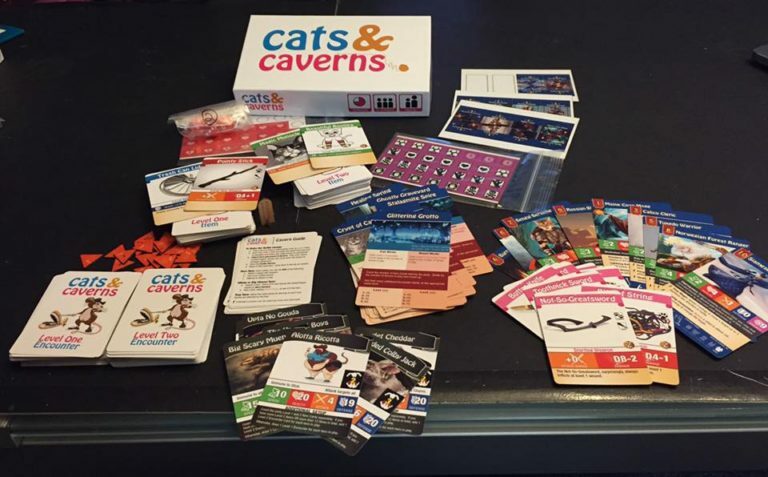 Cats & Caverns, one of the more recent games from Cray Cray Games. What do you look for when you come to GMG? We always look to see that the testers are enjoying themselves with whatever game we’re testing. Then there’s the nitty gritty interest points like how a specific bit of game play feels or how easy to understand a set of mechanics may be. We frequent Board Game Geek for reviews, forums, and to see what is trending, or “hot.” We are also big users and patrons of Kickstarter. We enjoy trolling the site to see what’s out there and when we see a diamond in the rough, we support the project. And lastly, Tom Vasel has done something amazing with Dice Tower by bringing board gaming back into the mainstream spotlight. Don’t get hung up. This means several things. First, don’t stagnate on a project that isn’t moving forward. Just shift focus to something else and come back to it with fresh eyes and an open mind. Secondly, don’t get hung up on feedback. Feedback is invaluable and should be considered, but so should your own experiences. If someone doesn’t like your game, don’t redesign it to fit them–it is your game, you like it, and you designed it for a reason. There are others like yourself who will like it. There is a lid for every pot. Phil is a project manager in healthcare IT and leads Epic implementation projects. He’s also a part of the project management office and has a focus on making processes at the organization more efficient. It’s actually more interesting than it might sound. Josh is a graphic designer both freelance and for the Massachusetts Teachers Association. When not designing board games, he is playing them and drinking a lot of wine (and spilling it everywhere when he’s had too much). Duh! 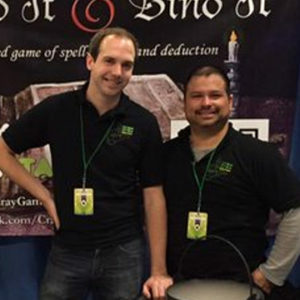 Aside from being active members of GMG, we participate by blogging and reviewing on craycraygames.com and on our facebook page, by attending a weekly game group, and by supporting other indie designers on Kickstarter. Phil has also been a co-instructor at Emerson for a game design course and has been a panel speaker at PAX East. Hidden Identity and/or traitor games. We enjoy these because if you can’t be a jerk to your friends, then it manifests itself at work and HR inevitably gets involved and, before you know it, you’re being escorted from the building by Sam from security. The opportunities are limitless. You can immerse yourself in an experience just like you would with a good book, except you get to do it in the company of friends and be social. Josh is a terrible waiter and has been fired from 16 restaurants and banned from 2 of them. It’s becoming a problem. Phil is an evil genius but gets lost in a paper bag… seriously, he can’t navigate to save his life.